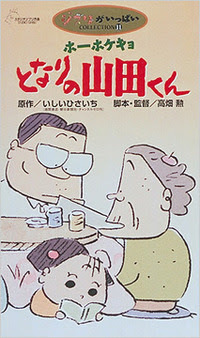 My Neighbors the Yamadas is a an extremely funny feature-length animated film directed by Isao Takahata released by Studio Ghibli July 17, 1999. This is the first Studio Ghibli film that was digitally produced without using cells. The movie captures Japanese daily life in a painted watercolor style accomplished by drawing three times the normal number of frames. The film plays like a series of comedy or sitcom episodes, many ending with a haiku poem. Released in the United States by Disney, I recommend watching the subtitled version, which captures the true spirit of the dialog in Japanese much better than the English dubbing and Hollywood character acting.